The T. Jerome Holleran (MSIA 1969) Scholarship Fund was established by T. Jerome “Jerry” (E 1957, MSIA 1969) and his wife, Carolyn Rae Holleran, both active philanthropists and supporters of Carnegie Mellon University. Jerry, the youngest of seven children, was the first male in his family to attend college. He earned a B.S. degree in electrical engineering from Carnegie Mellon University in 1957, as the recipient of a local benefactor, Dr.William Gruse. Jerry credits his early professional opportunities to the excellent technical education he received from Carnegie Tech, paving the way for careers at Westinghouse Electric Corporation and RCA, eventually winning a competitive two-year fellowship at the school of his choice. Jerry returned to Pittsburgh and CMU where he earned a M.S. degree in industrial administration in 1969. Jerry’s MBA propelled careers in management consulting at Booz, Allen and Hamilton, business planning at Rockwell International, marketing manager at Arrow Products Design and vice-president and COO of Arrow Precision products, a spinoff company of Arrow International. He is currently chairman of the Board of directors of Precision Medical Products which Jerry co-founded in 1997. Despite Jerry’s enormous business success, he has never forgotten his humble beginnings or the promise he made to Dr. Gruse to eventually “pass it on” to future generations. Jerry and his wife, Carolyn, are committed to giving back to their community and remain passionate in supporting their alma maters financially and with their time and talent. Today Jerry continues to serve as a Carnegie Mellon Trustee, a position he has had since 1994. 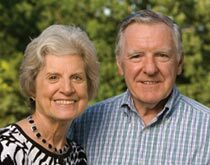 Jerry and Carolyn continue to help students further their education through their foundation to support scholarships such as the The T. Jerome Holleran Scholarship Fund. Since 2004 this scholarship has provided transformative learning experiences to dozens of students with a passion for entrepreneurship. In addition, their Holleran Scholarship Challenge has inspired more than 100 other donors to create new endowed scholarships.